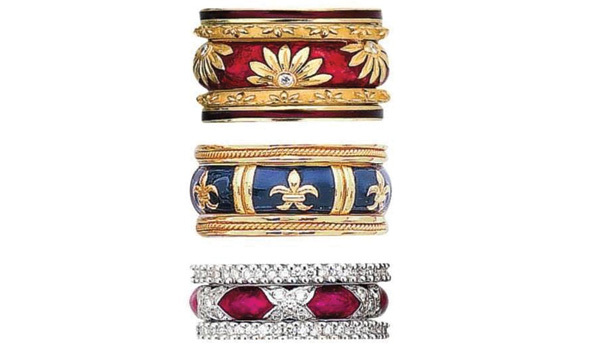 Hidalgo has often been referred to as “The King of Stackable Rings”, and now we have added more options of enamel with diamonds and combinations of black diamonds, brown diamonds, natural pink diamonds, natural yellow diamonds, any color of sapphire and semiprecious stones such as blue topaz, amethyst and peridot. Any of these can be done with any combination of our 20 colors of enamel as well. The caption occurred to me after seeing one of my favorite Bette Davis Movie, Now Voyager. This is the movie made famous when Paul Henreid, lights up two cigarettes and gives one to Bette. At this point Bette’s character says, “Jerry, don’t let us ask for the moon, we have the stars.” The scene takes place near a window where the moon and stars are clearly shown. You will find great values throughout our new collections. We have created new designs in all areas. Our hoop diamond hoop earrings have been expanded in many different colors of diamonds and designs, as well as our drop earrings, pendants, and bracelets. We hope you enjoy them.